We live in an age where concern for the food we eat, where it comes from, and how it was made plays a big role in how we buy. The things that we want from food are evolving and, if you can afford it, organic food is one of the more popular choices for our generation. 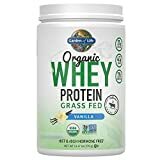 When it comes to whey protein, the organic label has become popular in recent years and organic whey protein is a big player in the $220 billion supplement industry. So, today we’re going to look at some of the most popular organic whey products on the market and whether they’re worth the price, what benefits they have, and what you need to know before shopping. What is Organic Whey Protein? Why Should You Choose Organic Whey? In the simplest sense, organic whey protein is protein powder derived from organic raw materials. This all hinges on what organic means – which is sometimes misunderstood. Organic, in contrast to ‘natural’ or ‘grass-fed’, is a legal tag that has to be awarded by the USDA. While grass-fed is a great way of getting the best nutritional value from your food, it’s not the same as organic. Organic regulates the chemicals cows are exposed to, while grass-fed just dictates their diet. Organic whey is about the product being produced without the use of a set of chemicals – from fertilizers to pesticides. Many people are skeptical about these chemicals, so organic options provide an option that is produced with a minimum of chemical interference. Organic is all about keeping a customer-friendly, minimal-chemical supply chain. From the grazing of organic cows to the way their milk is processed, organic is about keeping manufacturing practices as strict and use USDA-approved pesticides, fertilizers, etc. There’s a question around whether these are better or not, but if you’ve got the cash to spend and want the certainty, it’s a nice option. This is the big question: why should you spend more money on a whey protein that has almost no nutritional differences from the cheaper varieties? There are many reasons – you could just like the way the sticker looks. The most common ones fall into health concerns and environmental concerns. From a health perspective, many are concerned with the treatment of cows, their feed-quality, and their exposure to chemicals during the production process for milk/whey. This is based on the idea that these chemicals could well be present in the milk of cows, and thus in whey proteins and other dairy products. Is this a proven concern? Not yet. But it might be one risk you’re not comfortable with, and it’s a very valid reason to be concerned. Organic whey doesn’t have these problems to the same extent as the whole supply chain is regulated and can’t contain un-sanctioned chemicals. This should protect you from the worst of it and deal with antibiotic/pesticides from the cow’s diet. The environmental argument is simply that organic, regulated farming practices are better for animals, the environment, and the whole ecosystem. With the amount of environmental impact that beef farming has, this is another legitimate concern. If you’re looking to live a more environmentally-responsible life, organic whey could be a step in the right direction. There aren’t many dedicated, scientifically-proven nutritional benefits to organic choices. But they are likely to be more environmentally friendly and they do decrease your possible exposure to unnecessary chemical elements from the farming process. These are definitely advantages. 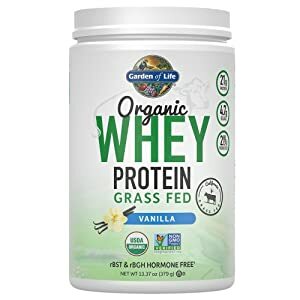 A company that prides itself on a USDA organic certification as well as various other good manufacturing practice standards: humane association certified, Kosher organic, and GMO-free whey protein. With all these labels, it’s off to a good start for those who are concerned with the environmental and ethical concerns about whey protein. This is also a grass-fed company, so the quality of the resulting product is assured to be both safe and nutritionally-complete. Off to a great start! 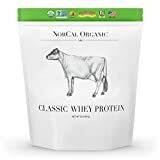 NorCal Organic also make a point of not using unhealthy hormone treatments on their cows, with a no-bleach, no-acid process. This is another feather in their cap – it’s another way of removing common worries that surround the whey protein industry and ensuring that you’re getting nothing but the good stuff. 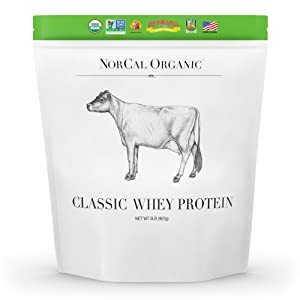 The obvious problems with NorCal’s Organic Whey are something we’re going to see a lot of on this list: the markup is huge and the protein content of a single serving is low compared to non-organic proteins and even those that are on this list. This is offset slightly by the inclusion of glutathione (a crucial immune function compound) and a variety of other beneficial forms of protein. While it’s not as overtly well-manufactured as NorCal, Natural Force also carries the USDA certification and is a grass-fed product. Once again, these two simple factors provide a lot of value to the ethical/environmental and health benefits of the product. Natural Force is cheaper than NorCal, but it also provides a slightly smaller amount of protein per serving – which is counter-intuitive since the serving size is actually larger. The dosing of key amino acids is great, but it doesn’t contain additional health-promoting compounds like glutathione. While only having one ingredient is a great sign of the predictability and no-nonsense approach the company takes, it is also a downfall. While organic, grass-fed whey is a great choice, it doesn’t provide many ways to stand out. Natural force doesn’t seem to stand out to us at all, despite having nothing wrong with it! Another supplement that focuses on small-farm, grass-fed organic whey protein. This comes with the assurance of hormone-free cows providing organic milk for no-acid, no-bleach processing. 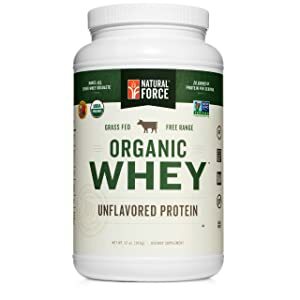 This is somewhere between the two we’ve already discussed: more to talk about than Natural Force, but without the specific certifications of the NorCal whey. The list of certifications for raw organic is also quite long: GMO-free, soy free, gluten free, corn free, and supposedly voted the worlds best organic whey protein (though we’re not sure by whom). This is a much cheaper source than those listed above, with a greater number of servings for your hard-earned dollars. The protein content is also higher than Nature Force, and on par with NorCal. With a diet of wild grass and clover, the dairy making up raw organic’s whey is actually naturally-high in Omega-3 fats and CLA. The former is an essential part of any healthy diet, while the latter may have some modest benefits to blood health. 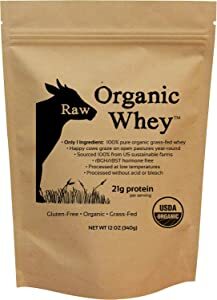 If you’re looking for a great organic whey and want to improve your diet/environmental impact without spending lots of cash, Raw Organic Whey is a great place to start. We think this is a great way of making organic whey more accessible for most young adults/athletes. This is another protein powder that fails to stand out to us. As with the Nature Force, there’s no problem with the actual product, but it doesn’t have anything to recommend it to us above and beyond its competitors. This is clear that, like nature force, it sells itself on only containing one ingredient. This isn’t bad, but it’s a run-of-the-mill claim and doesn’t give us any reason to choose protein 17. Of course, this one-ingredient claim only applies to the unflavoured whey. What we like about protein 17 is that, in flavored versions, they use coconut sugars, sea salt and raw cacao for flavorings. These provide a great flavor and some mild health benefits that are definitely worth having if you’re looking for something simple. Overall, we’re definitely fans of Protein 17 – we’re just bigger fans of NorCal and Raw Organics. 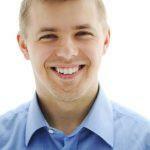 The problem Protein 17 runs into is very common: it’s not out-doing its competitors! The Garden of Life protein takes a slightly different approach to the protein supplement – focusing on a combination of grass-fed organic protein with probiotics. They also include certifications that are competitive with NorCal’s wide range: USDA organic, GMO-free, Humane Association certified, hormone-free, and more. As with the others on this list, we’re confident in the manufacturing practices and health-quality of the product. The robust good-manufacturing practices are clear in all of the products and this is no exception. The first reason you might not pick Garden of Life is simply the low protein content. While each serving is 21g of protein (a standard dose), the serving size is actually the largest on this list. This means that it’s going to be less protein in the long-run. This isn’t a huge deal on a day-to-day basis, but it does mean that others are going to be a superior protein source. It also contains less leucine than others on this list in this larger serving – the key amino acid for signaling muscular recovery/growth. These are two big problems because overall protein content and leucine content are the biggest factors in protein supplement effectiveness. 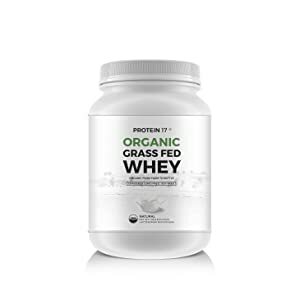 When it comes to the supplement market, there are some serious concerns out there and we think that the trend towards organic, grass-fed protein supplements is a good one. The problem with discussing what you should buy is that there are very few differences or distinguishing factors. Unlike many of the reviews we’ve done, all of these products are great. 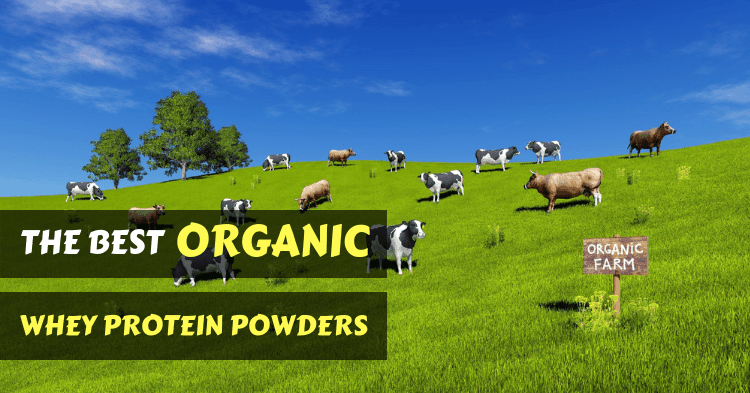 There are some that are better than others, but these are all going to address the big health and environmental concerns that have made organic whey so popular. We’re big fans of the NorCal whey protein if you’re looking for the most ethical, well-certified protein. It carries a big price tag but is an assured, high-quality product. Otherwise, we recommend the 5lb of Raw Organics. 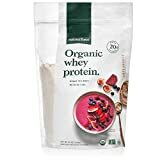 It’s a high-quality, lower-cost approach to organic protein that also contains Omega-3 fats and CLAs – great additions to the already-good protein source! If you’re concerned with your own health, and the health of the environment, organic whey proteins provide a great range of products that are assured to be risk-free.